Cube the apple, melon, and watermelon. Remove the leaves from the strawberries and cut them into slices. 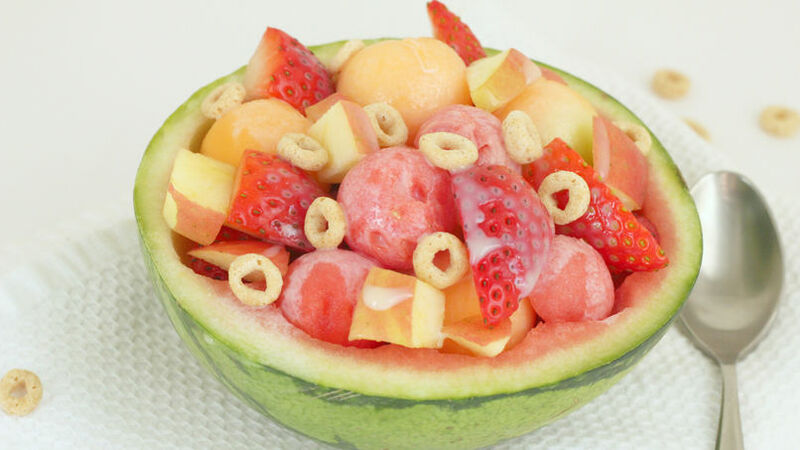 Place all of the fruit in a bowl and mix it well. Dress it with the condensed milk to your liking and add the Cheerios™. Use the fruit as bowls in which to serve the salad. You can use watermelon, melon, pineapple, or even orange halves. There’s nothing more refreshing than enjoying a good fruit salad like this one. It’s a delicious way to start your day, or to serve after dinner as one of the most delightful desserts. Ideally you should use fruits that are in season. This way you’ll not only enjoy them at their peak flavor, but you’ll also get them at a good price. I generally include apples, melons, and strawberries when making the fruit salad. Condensed milk or yogurt-based dressings are among my favorites. Also, I never forget to add a little bit of cereal to the fruit salad to give it that yummy crunchiness. Cheerios™ are perfect for that!